Blogging holds a special place in my heart. I guess I'll keep blogging as long as I still find valuable topics to blog about that I know will be helpful for my readers out there. However I also suffer from blogger's block. A state when I have zero idea on what topic to blog about and how I will be able to keep contents coming for both IzzaGlino and SavingsPinay for the next weeks to come. The first problem every blogger encounters is finding a topic to write about. Times when every other topic seems so good to talk about but you don't have that much intention and inspiration to write. So as part of may Blogging Tips I am listing down a whole lot of blog topics that you could write about. Since my niche is a beauty and lifestyle blog as well as a financial blog I can only give you topics that belong to the said niche. I'll have it as a two part series. Next week I’ll write about blog topics for a financial blog. Most of these blog topics I have already and/or will be writing for this blog too!!! I hope the above topic recommendation helps. 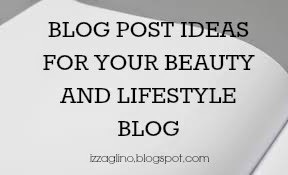 Next week I will be giving tips on blog topics concerning a Financial Blog. Here are sample blog posts for each topic above. Enjoy blogging! 5 New Videos from My Youtube Channelf - New! All About Moisturizers (My Top Finds, What I Use, How to Choose and When to Use) - New! Ever Bilena Eyeshadow and Blush Palette Swatch and First Impression - New! Product Hype: Nivea Vanilla and Macadamia Kiss Lip Butter - New!